Good headphones can change your life in more ways than you’d expect. Being able to listen to an infinite supply of streamable music, podcasts, and other content is nothing short of incredible. In order to fully enjoy your content you’ll need a good pair of headphones. There are countless high quality pairs of headphones on the market that are still at an affordable price point. However, in an increasingly wireless age many people may find themselves looking to cut as many cords out of their lives as they can. Bluetooth headphones are a great way to get high quality sound without and extra wires to worry about, and as some phones choose to drop the headphone port altogether they make perfect sense. However, the biggest barrier for a lot of people moving to bluetooth headphones is the notoriously high price. We took a look at all the wireless bluetooth headphones on the market that bring you an affordable price as well as high quality tech in order to bring you a list of the best bluetooth headphones under $100. We began our search for the best budget wireless headphones by looking at headphones using bluetooth for wireless connectivity, and narrowing the field by price. We were sure to pay attention to headphones from reputable manufacturers in order to guarantee quality. We determined this final list by pouring over technical specifications and user reviews as well as taking into account which features are most important in wireless headphones. Once we had these criteria, we tailored our list to the Bluetooth Headphones that will give you the best experience possible while remaining affordable. We compared every nuance of these headphones and weighed each category in order to bring you the five best Bluetooth Headphones under $100. When it comes to any headphones, the most important feature is undoubtedly the sound quality. A good pair of headphones is nothing without good sound quality that will give you great playback of your favorite music or shows. We were sure to take a look at, and include in this list, the different sound technologies used by each of these headphones so that you can make an informed decision about your purchase. We examined headphone driver sizes, the audio range given by each pair of headphones, and the underlying technology when compiling this list. We prioritized sound quality over every other feature, because no amount of flashy features can make up for lackluster sound quality. 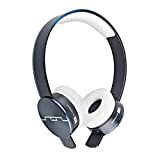 A good bluetooth headset will have top notch sound quality despite their wireless status, and we also focused on headphones that give you the best sound quality available without breaking the bank when making our list. The next feature we examined was the design of each pair of headphones. A good pair of headphones will look good and be a worthy companion to your new laptop, smartphone, or other device. However, we didn’t just focus on aesthetics when looking at design. A good pair of headphones will last you for years, and won’t give out after small amounts of wear and tear. We were sure to prioritize headphones with high quality construction so that you can be sure that your headphones will stay with you for as long as you need them to. The design of your headphones is the first thing people will notice about your headphones, but more importantly than aesthetic design or build quality is the comfort of your headphones while you’re wearing them. With good headphones, you won’t have to to take them off due to discomfort, and after hours of listening you won’t feel overheated or uncomfortable. For these reasons design was the second most important feature we considered when building our list. When you’re listening on your new headphones, the last thing you’ll want to realize is that you forgot to charge your headphones overnight and they you’ll have to wait until you get to a wall outlet in order to listen to music. Battery life is incredibly important to any pair of Bluetooth headphones, and we were sure to consider the battery life of each pair of headphones when compiling this list. Or, if you’re a light user who will only be using your headphones at home you may not need long battery life. We were sure to include headsets that prioritize other features over battery life while staying at an affordable price point when compiling our list. Built in controls on the cable of headphones have become an essential part of any headphones. While Bluetooth Headphones lack a cable, many still opt to include controls on the headphones themselves. In addition to standard buttons, we gave extra points to headphones that had any form of innovative controls so that you can get the best experience possible. While all the headphones featured here include Bluetooth Wireless connectivity, you may find yourself wondering if your new headphones will work with your older, or newer device. In addition to Bluetooth Connectivity, we payed attention to the types of charging connection used by each pair of headphones. Some people may also prefer wireless headphones with some sort of wired backup in case the headphones run out of batter or you are forced to use a device that doesn’t support bluetooth. We gave extra points to headphones that included these extra features. Our #1 Pick for Bluetooth Headphones under $100 were the Sony MDRZX770BT. These Sony headphones combine some of the best technology available with an affordable price point landing them at number one on our list. Starting with sound quality, these Sony headphones use two 40mm drivers that deliver balanced and accurate sound with a frequency response of 20-20,000 Hz for an incredibly accurate listening experience. And, using the included audio cable you can experience and extended frequency response of 8-22,000 Hz for even better sound quality. These headphones feature one of the best designs we reviewed and include a padded headband, padded and breathable ear cushions, and rotatable ear cups for increased comfort. They also sported some of the best build quality we’ve seen in wireless headphones. The included battery life is a superb 17 hours of continuous wireless playback. In addition to playback, you can expect 17 hours of hands-free calling, and up to 450 hours of standby. The earcup of the Sony headphones comes with a phone button, that allows you to take and end calls with a single button push. Also on the earcup are a power button and volume buttons for easy control without having to reach for your phone. The connectivity of the Sony headphones is the best we reviewed, as a single touch connects the headphones to your devices using NFC technology. The high-quality Bluetooth 4.0 coupled with AAC and apt-X support give you the best wireless sound available, and the included audio cable is perfect for when you don’t mind the extra wire. The headset charges using a standard micro usb cable, making it an ease to charge. 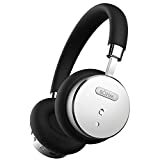 Next on our list are the Bohm Bluetooth Wireless Noise Cancelling Headphones, which pair advanced features with an aesthetically pleasing design and a low price point. The Bohm headphones use two high-end drivers that each sit at 40mm and crank out sound at a range of 20-20,000 Hz. However, these headphones place an emphasis on bass. Most importantly, these headphones include active noise cancellation. At the flip of a switch, these headphones will block outside noise, allowing you to be fully immersed in your music. The design of the Bohm headphones is aesthetically top notch and is sure to pair well with your new laptop or smartphone. The earcups and headband rest softly for hours of “fatigue-free” listening. One thing we really loved about these headphones are their battery life. The built in 290mAh battery charges rapidly in three hours, and provides up to 16 hours of playback or 18 hours of talk time. An inline remote and microphone allow you to take hands-free calls, and resume your music without skipping a beat. The connectivity is really where the Bohm headphones shine. The Bluetooth 4.0 supports a variety of wireless standards, including A2DP, HFP, and HSP for a fully wireless experience and sports a 33 foot range. Next on our list is the Skullcandy Grind, which pack great sound and design in an affordable package. The dual 40mm audio drivers provide great quality audio no matter what type of music is being played. The massive speakers make sure you don’t miss out on anything. The design of the Grind is one of our favorites. It’s a modern minimalistic design that couple a great aesthetic with some really great build quality. The durable metal headband keeps the headphones secure. The plush ear pillows are designed for all day comfort. The battery life on the Skullcandys is a bit weaker than on the previous headphones on our list, as they allow for 12 hours of playback on a single charge. However, this won’t be a problem for many who listen to music in short bursts or in their house. The built in remote on the Grind headphones allow you to play and pause your music, skip tracks, adjust volume, and answer and end calls all without having to reach for your phone. The back up Aux cable with microphone and remote is perfect for those who either don’t feel like charging their headphones, or want to extend their twelve hour listening session. Fourth on our list is the SOL republic tracks Air Headphones, which come with an absolutely amazing design and top level technology. These headphones are not without their faults, as they come in just around or slightly over our budget, depending on where you look. However, we just couldn’t overlook their amazing features and design. These headphones use two A2 sound engines which deliver clear highs and detailed deep bass. While these weren’t the best sounding headphones we reviewed, they certainly do provide great sound quality, albeit a little overpriced. The design of the SOL headphones is really where they shine. The interchangeable headbands is something you can’t find elsewhere, and the independent ear cups are immensely comfortable and give the greatest range of customization we found. The battery on these headphones is average, and is one of the corners that was cut in order to create such a great design. One of the best features on these headphones are their ability to connect to two devices simultaneously. This allows you to answer a call from your phone while watching a movie on your tablet or laptop. The connectivity of these headphones is top notch, and they are rated for connectivity 150 feet away. The built in microphone enables hands free calling, and the on ear cup controls allow for quick adjustments. Rounding out our list of the best bluetooth headphones under $100 are the JBL E40BT wireless headphones. The JBL signature sound with PureBass performance, coupled with the premium 40mm drivers, deliver a full spectrum of sound with complete clarity and powerful bass. The design of these headphones is a little lackluster, and there are definitely some areas that could be improved. However, the ergonomic headband and leather ear cushions do provide some great comfort, though they won’t turn any heads. The built in battery provides 16 hours of uninterrupted listening, which is slightly above average. An interesting feature of these headphones is the built in “Share Me” technology that allows you to share your content with another set of headphones simultaneously. The included Aux cable is a great backup in case your battery dies, and it includes on cable controls for taking control of your music. While they are the least flashy headphones we reviewed. The JBL headphones are a solid pair of bluetooth headphones at a good price. A good pair of headphones will make a noticeable difference in your listening experience, as superior audio technology and features give you great sound quality and ease of use. Those looking to cut a cable out of their lives can turn to Bluetooth headphones for both wireless connectivity and great sound. Our number one pick was the Sony MDRZX770BT headphones for their impressive sound and build quality, as well as their top of the line features at an affordable price point, though it is a bit higher than the other headphones we reviewed. However, every one of the headphones we featured here brings something different to the table, and each are sure to give you an incredible listening experience free of tangled wires. 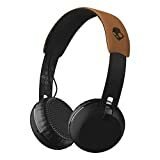 Can you still find quality, budget headphones even if they're bluetooth? Find out in our review of the Best Bluetooth Headphones under $100.